We all have experienced 30+ degree days, which can be hard to handle at times. How often do you choose to spend such days at home with air conditioning or fans on? Well this article is about a different kind of choice. It is all about enjoying what the summer has to give us! Here are 5 ways to survive a heatwave. If it's hot, and you cannot wait to get outdoors, add these ideas to you to do list for this summer. Whether you fancy an enduring swim or a casual dip in the water, be assured your body will recover from the heatwave fast. Swimming is a great way to tone your body and refresh yourself and your mind. Swimming is also a great way to keep your fitness levels up when you're not kiting, sailing, windsurfing, etc. Hot periods can usually be associated with better bay water quality also - all the more reason to jump in the water for a swim! If the Vic Wind App is showing calm, still winds, then it is the best time to put yourself on a SUP board and paddle into deep waters or along the shore. Did you know that catching waves can be easier than surfing? And what about the new trend of yoga classes on a SUP? 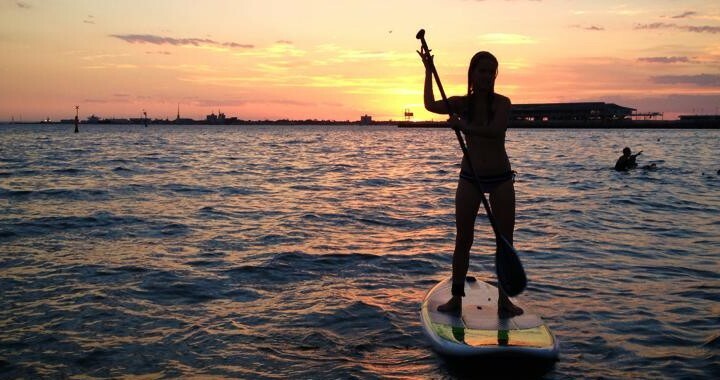 Not only does SUPing improve your balance and core strength, it also allows you to explore your familiar surroundings from a completely different angle. 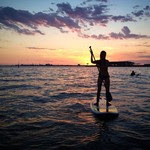 Regardless whether it's a bay, an inland lake or a coastal beach closest to you, check out if you can rent a stand-up paddle board nearby or borrow from your friends. This water sport is becoming more and more popular every day so there are plenty of options to choose from. No matter how hot it is inland, you can be guaranteed to find a cooler spot by the beach. Enjoy the cool seabreeze. Take your dog or your neighbor's dog and head close by the water. Use this as an opportunity to have some fun playing with your beloved pet and meeting new people if that is your intention - who doesn't love padding friendly dogs walking by? As the world champion surfer Kelly Slater would say "Life's worth experiences and it's worth the people in your life too" - playing games with your friends and even strangers on the beach can be a great way to stay active and social. Choose your favorites, or try some new games, like Frisbee or Beach Cricket. Find a volleyball net, e.g. 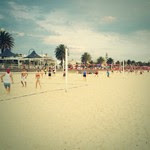 at St Kilda beach (Port Phillip Bay, Victoria), even try to book a session if you need some coaching. For those who like jogging or running, hot days may be a real pain. But sticking to your good habits is still doable. Simply keep an eye on weather forecast during different times of the day - be it an early morning or a picturesque sunset time. Stay away from the heat and find the right conditions to continue running outdoors. What will you try on the next hot day? Vic Wind App - a free iPhone app that provides up-to-date and accurate wind observation and weather forecast for Victoria, Australia. It is used by those that love outdoor activities, such as kitesurfing, windsurfing, cycling, sailing, etc. 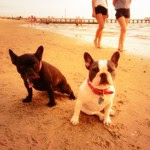 Posted in Vic Wind News and tagged active lifestyle, beach volleyball, heatwave, hot, Melbourne, outdoors, running, summer, SUPing, swimming, Vic Wind App, walking a dog.